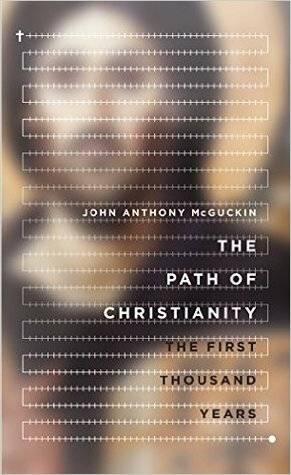 I’ve recently perused John Anthony McGuckin, The Path of Christianity: The First Thousand Years (IVP Academic 2017). I’ve not read the whole thing — frankly, I don’t have time, since it’s 1145 pages long and much of it is not pertinent to my current research, whether patristic or medieval, nor to my upcoming teaching in the Autumn (Latin epic and Latin verse epistolography in Autumn, and Theocritus and Greek Mythology in January). My first thought is: What on earth students could use this as a textbook for a one-semester course on first millennium Christianity? Its 1145 pages are large with a typeface that, while not minuscule, is not large itself. Maybe students at Union Theological Seminary and Columbia are of a higher calibre than what I’ve experienced. Maybe McGuckin doesn’t actually intend you to use the whole book as a textbook; but he does intend it to be useable as a textbook. That said, a certain amount of text is taken up by readings. So maybe it would work if you didn’t assign a separate book of readings. 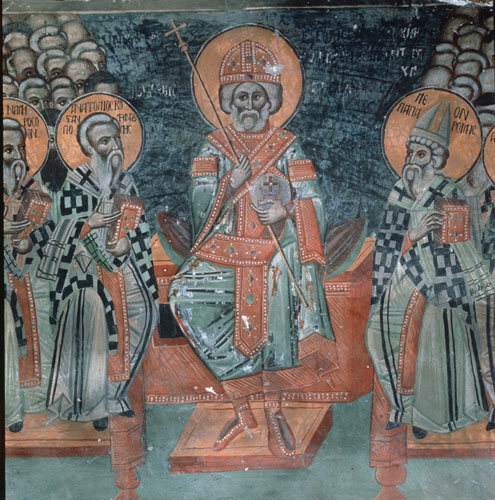 In terms of coverage, it is geographically broad, but most interested in patristic and Byzantine things. Nonetheless, it does reach as far East as China and as far South as Ethiopia. There is a whole section devoted to churches outside the Latin-Greek spectrum that takes up most of the attention in church history books. The volume is divided into two sections, one that is a diachronic study of the story of the church and doctrine, whilst the other is an investigation of particular themes. McGuckin’s advice is to read part one in order but to intersperse the chapters from part two along the way, in whatever order you please. I read a good chunk of Chapter 13 (pp. 763-789), and this chapter I recommend heartily: ‘The Bible and Its Interpretation in the Early Church’. He takes to task the modern approach to biblical studies, arguing that the ecclesial way of reading Scripture was prevalent amongst all Christians prior to the nineteenth century. I always like this kind of thing, because is the Bible is God’s revelation to humanity, then there are legitimate ways of reading it other than ‘how I read any other ancient text’, and it will also legitimately speak to us in different ways. It seems patently obvious to me. That’s why I do Latin and Patristics, not Biblical Studies. The first chapter is also very good. He gives good coverage of the early movements within the Christian movement, and I would feel comfortable giving it to my students to read. His central thrust here is that the second century is one of the most important for everything that follows, and I agree. I did not agree with every chapter I dipped into, I must admit. I think there’s more to Leo the Great’s Tome than McGuckin acknowledges, but I think most people miss what’s going on because the issue is not whether Leo is in step with the times or any of that, but, rather, cross-linguistic theology done by a Latin and the actual semantics of natura vs. physis. But most people don’t think about Latin Christology this way, seeing, as here, it as simply a re-statement of Hilarius of Poitiers and Augustine full stop. But that shouldn’t stop you from reading what McGuckin has to say here. Likewise, I wasn’t sold on his interpretation of the Pelagian debate as manufactured by Augustinians and not actually a thing. My own position in this debate tends more towards the East, but given how much energy was expended in the initial Pelagius-Caelestius end, and then against Julian of Aeclanum, and later amongst so-called ‘Semi-Pelagians’ and ‘Augustinians’, I think something was happening here. Why is it confined to the Latin West? I’m not going to be reductive about every East-West difference, but I do suspect that gratia is not charis. My final similar lament is simply a matter of a different reading of evidence for the Acacian Schism. McGuckin takes the standard line that it was over the Henotikon, but it is evident to me, at least, that from Gelasius’ standpoint, visible in his letters at length, it was Acacius entering into communion with Peter Mongus that was at least as important, if not more so. Some of the translations of primary texts in the readers accompanying each chapter were a bit stilted. In all, if you have some time, read the bits that interest you. If you have more time, read all 1145 pages. If have a lot more time, add the appendices on top. Our Saviour, dearly-beloved, was born today: let us be glad. For there is no proper place for sadness, when we keep the birthday of the Life, which destroys the fear of mortality and brings to us the joy of promised eternity. No one is kept from sharing in this happiness. There is for all one common measure of joy, because as our Lord the destroyer of sin and death finds none free from charge, so is He come to free us all. Let the saint exult in that he draws near to victory. Let the sinner be glad in that he is invited to pardon. Let the gentile take courage in that he is called to life. For the Son of God in the fulness of time which the inscrutable depth of the Divine counsel has determined, has taken on him the nature of man, thereby to reconcile it to its Author: in order that the inventor of death, the devil, might be conquered through that (nature) which he had conquered. And in this conflict undertaken for us, the fight was fought on great and wondrous principles of fairness; for the Almighty Lord enters the lists with His savage foe not in His own majesty but in our humility, opposing him with the same form and the same nature, which shares indeed our mortality, though it is free from all sin. Truly foreign to this nativity is that which we read of all others, “no one is clean from stain, not even the infant who has lived but one day upon earth.” (Job 19:4) Nothing therefore of the lust of the flesh has passed into that peerless nativity, nothing of the law of sin has entered. A royal Virgin of the stem of David is chosen, to be impregnated with the sacred seed and to conceive the Divinely-human offspring in mind first and then in body. And lest in ignorance of the heavenly counsel she should tremble at so strange a result, she learns from converse with the angel that what is to be wrought in her is of the Holy Ghost. Nor does she believe it loss of honour that she is soon to be the Mother of God. For why should she be in despair over the novelty of such conception, to whom the power of the most High has promised to effect it. Her implicit faith is confirmed also by the attestation of a precursory miracle, and Elizabeth receives unexpected fertility: in order that there might be no doubt that He who had given conception to the barren, would give it even to a virgin. Therefore the Word of God, Himself God, the Son of God who “in the beginning was with God,” through whom “all things were made” and “without” whom “was nothing made,” (John 1:1-3) with the purpose of delivering man from eternal death, became man: so bending Himself to take on Him our humility without decrease in His own majesty, that remaining what He was and assuming what He was not, He might unite the true form of a slave to that form in which He is equal to God the Father, and join both natures together by such a compact that the lower should not be swallowed up in its exaltation nor the higher impaired by its new associate. Without detriment therefore to the properties of either substance which then came together in one person, majesty took on humility, strength weakness, eternity mortality: and for the paying off of the debt, belonging to our condition, inviolable nature was united with passible nature, and true God and true man were combined to form one Lord, so that, as suited the needs of our case, one and the same Mediator between God and men, the Man Christ Jesus, could both die with the one and rise again with the other. Rightly therefore did the birth of our Salvation impart no corruption to the Virgin’s purity, because the bearing of the Truth was the keeping of honour. Such then beloved was the nativity which became the Power of God and the Wisdom of God even Christ, whereby He might be one with us in manhood and surpass us in Godhead. For unless He were true God, He would not bring us a remedy, unless He were true Man, He would not give us an example. Therefore the exulting angel’s song when the Lord was born is this, “Glory to God in the Highest,” and their message, “peace on earth to men of good will.” (Luke 2:14) For they see that the heavenly Jerusalem is being built up out of all the nations of the world: and over that indescribable work of the Divine love how ought the humbleness of men to rejoice, when the joy of the lofty angels is so great? 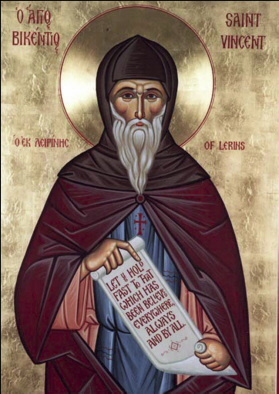 Let us then, dearly beloved, give thanks to God the Father, through His Son, in the Holy Spirit, Who “for His great mercy, wherewith He has loved us,” has had pity on us: and “when we were dead in sins, has quickened us together in Christ,” (Eph. 2:4-5) that we might be in Him a new creation and a new production. Let us put off then the old man with his deeds: and having obtained a share in the birth of Christ let us renounce the works of the flesh. Christian, acknowledge thy dignity, and becoming a partner in the Divine nature, refuse to return to the old baseness by degenerate conduct. Remember the Head and the Body of which thou art a member. Recollect that thou wert rescued from the power of darkness and brought out into God’s light and kingdom. By the mystery of Baptism thou wert made the temple of the Holy Ghost: do not put such a denizen to flight from thee by base acts, and subject thyself once more to the devil’s thraldom: because thy purchase money is the blood of Christ, because He shall judge thee in truth Who ransomed thee in mercy, who with the Father and the Holy Spirit reigns for ever and ever. Amen.